The new Philharmonic Concert Bass Drums are offered in 100% African Mahogany shells while the Symphonic Concert Bass Drums are offered in 100% Maple shells. Both series come standard in a Matte Walnut lacquer finish and feature 2"wide Maple Hoops finished in Matte Walnut, Silent Tension System, 8mm Handle Bolts, and Fiberskyn III heads. The 2" wide Maple Hoops offer superior strength and ease in tuning while the Silent Tension System allows for creek-less tuning. Split tension lugs allow the shell to vibrate for unparalleled resonance and openness of sound while Remo Fiberskyn III heads have the sonic benefits of calf without the maintenance of natural skin. The 100% African Mahogany is currently available in the following sizes, 28X14, 32X16, 36X16, and 36X18. 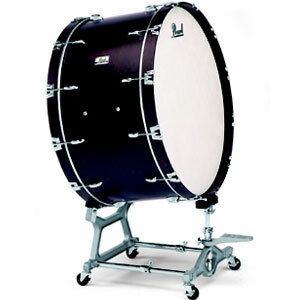 The 100% Maple is currently available in the following sizes, 28X14, 32X16, 32X18, 36X16, 36X18, 36X20, and 36X26.